The GRSEC is a non-profit, education society dedicated to the preservation of genealogy and genealogical sources in the Eau Claire area. Meetings are held on the second Saturday of every month from September through May in the Chippewa Valley Museum in Carson Park, Eau Claire, Wisconsin. Meetings begin at 10:00 AM, with informal help and coffee being shared by members at 9:30 AM until the start of the meeting. The public is invited. Sawdust City Roots is published by the GRSEC for the use of all society members, five times a year: September/October; November/December; January/February; March/April; and May. The GRSEC does not meet during the summer months (June through August). The membership year runs May 1st through April 30th. Membership fee is $10.00 per year, beginning May 1st. The Drammen Lutheran Church Cemetery has been in use since 1873, the year the congregation was organized. The congregation was originally named Beef River Congregation and the locale was known as Nelsonville. The name was later changed to Drammen Norwegian Lutheran Church. The Drammen Lutheran Church Cemetery Association was formed almost 60 years later on February 7, 1932. The rate charged for plots for Perpetual Care was $50. The cemetery was in use for about 19 years before first church building was finished enough to be used in the summers starting in 1892. The Oak Grove School still had to be used for services in the winter for 18 years. In December of 1933 the original church building burned down and a new church was built a little to the north. The cemetery expanded onto the land where the original church once stood. Not to be confused with Drammen Lutheran Church Cemetery, Drammen Cemetery is located adjacent to where Oak Grove School once stood. The two cemeteries are not connected in any way. Records for many of the burials in the Drammen Lutheran Church Cemetery are kept in the safe in Drammen Church. The records in these very old, fragile books were penned in Norwegian until the mid-1930s. 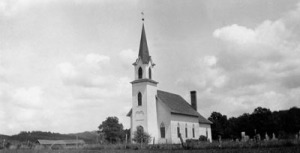 Drammen Church also has the original church records for the Lutheran church that was located at Porter’s Mills, south of Eau Claire along the Chippewa River.